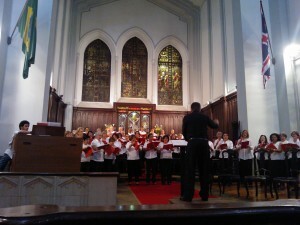 This year the SCM’s Sing Along of the Messiah will be in Christ Church at 8pm on Monday 10th of December 2012. All who love this work are welcome to come and sing along (scores will be available) or to come to listen. Soloists are from the SCM Choir, the orchestral accompaniment is by David Chew’s Rio Strings, with Inês Rufino on organ and Ruy Wanderley conducting. Every year, dozens of invitations go out like this – throughout the UK, the United States, in Europe – and even apparently in China! The formula is the same – no rehearsal, come along and sing! There are usually professional soloists, orchestra, organist and conductor to hold it together – but what happens, happens. And what usually happens is an amazingly moving, spontaneous experience for all participants. For instance, an organization called The Really Big Chorus gets together a “Messiah from Scratch” every year at the Royal Albert Hall, with over 3,000 in the choir. The Hallelujah Chorus must be quite something! But why a Sing-along? And why the Messiah? A sing-along – forming a choir just for that occasion – naturally relies upon a pool of accomplished choral singers who have learnt the work in the past, and who would like to sing it again. There must be an organization to arrange the place, the time, and the professional participants. The amateur participants are accepted as they apply, although there may be some limits placed so the voices do not get too out of balance. (Tenors are always in short supply, but sopranos/contraltos just the opposite!) Or perhaps just turn up and sing! Very often the organization is done by volunteers in their spare time, and if there is a charge, it is used to cover costs, with the surplus going to charity. But it does seem that music, once learnt, is kept in a place in our mind where it comes back very quickly on demand. You can find this if you try singing karaoke – which reminds you of the words but leaves the song up to you. If you are brought up with classical music, and rehearsed a piece of music, then it is in there somewhere – and having the score enables you to bring it all back. So for the participants, they have the pleasure of re-living fine experiences of the past, together with lots of like-minded folks, and adding a special new one, as it turns out this time. Costs are low, and the sense of fulfilment high. Perhaps this is the clue to the popularity of Sing-along events. In the UK setting, this fits in very well with many retired people being quite well off, and not having so many family ties as is common in Latin cultures. So an event like this gives people something to work towards, keeps alive a skill – and is often a reason for travelling to different places and socialising with different people. The repertoire for Sing-alongs is obviously confined to pieces which lots of people will have learnt. Apart from the Messiah, I have seen reference to Sing-alongs of Vivaldi’s Gloria, Mozart’s Requiem, Brahms’ Requiem, Fauré’s Requiem, Verdi’s Requiem, (that’s enough Requiems!) – Haydn’s Creation, Carl Orff’s Carmina Burana, and Karl Jenkins’ The Armed Man – a Mass for Peace. And sometimes it may be short parts of other well-known works. But the most popular work, particularly at Christmas-time, is Handel’s Messiah, a Sacred Oratorio written in 1741. In its original form, the work is long, taking the story of Christ from early prophecies and his birth, through His Passion and Resurrection, to the Revelation. But it is usually adapted to the occasion and tastes of the audience, as it was by Handel himself. The choral writing is made up of interlocking lines, often the same phrase being sung again by the different voices (soprano, alto, tenor, bass) with a bit of a delay, or higher or lower than the previous voice. This means that there is drama and strength when all the voices come together, and Handel is a master of building up the effect throughout a chorus. The phrases of the music are longer and more ornate than we are used to today – long runs, or phrases which go repeating a pattern of notes moving up or down. This demands quite a lot from the singers in terms of breath control, and maintaining clarity and evenness throughout the phrase. However, there are no dissonances, and in progressing from one harmony to another, Handel doesn’t adventure as much as does Bach. Nor, in the Messiah, does he write very high or very low. Does this sound like a recipe for singers to have fun? It is indeed! When you are singing, you are conscious of the need to be precise in your own part, and you can hear how it fits with the others, and how the orchestra underpins it, and puts in phrases of comment or embellishment. So there is a collective thrill when it all comes off. Another endearing aspect of the Messiah is the way the words are “pictured” in the music. For instance, in the bass Aria, The people that walked in darkness have seen a great light, the bit about darkness sounds just like someone groping around in a darkened room – short phrases, up and down, searching around…. and then on light, the music straightens up, with high, long and joyous sustained notes. Later on, in the contralto Aria He shall feed his flock like a shepherd / and He shall gather the lambs with his arm / and carry them in his bosom, the music is gently rocking, full of rest and comfort. The most famous chorus – Hallelujah! – comes in fact at the end of the second part, although it is usually sung at the very end of a performance. This was undoubtedly written for a heavenly chorus, and is justly famous for its expression of joy and faith. In the last part of this chorus, the ladies sing King of Kiiiiiiiings with a long sustained note, while the men and orchestra go – for ever, and ever, Hallelujah! – then the trumpet wings in to reinforce the women’s voices, as the music goes higher and higher…. then the roles reverse, with the men doing King of Kiiiiiiiings, until all voices and orchestra come together: for ever, and ever, Hallelujah! Sing-along on 10th December in Christ Church! As usual for us, this Messiah will be just the 1st (Christmas) part, plus the Hallelujah Chorus. Some years ago, just as we got to the Hallelujah, all the lights failed in the neighbourhood. But nothing daunted – and with the conductor a ghostly figure in the gloom – musicians and singers carried on playing and singing by heart – and it was even better than usual! This entry was posted on Tuesday, November 20th, 2012 at 11:08 am	and is filed under Classical. You can follow any responses to this entry through the RSS 2.0 feed. Both comments and pings are currently closed. Entries (RSS) and Comments (RSS). 24 queries. 0.291 seconds.